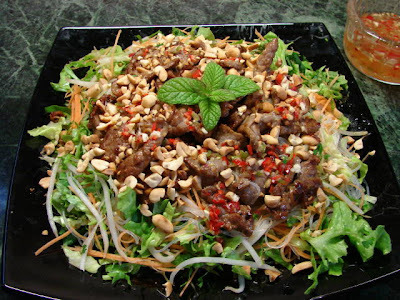 Similar to nue num tok , Bun Bo Xao is Vietnamese version of beef salad, refreshing and full of goodness. Once you got all the ingredients prepared it is very simple. Prepare the beef, remove any gristly bits on the beef and cut the meat into very thin slices. Chopped garlic. Remove the outside 2 tough layers of the lemongrass, top and tail then cut the bottom 3 inches into paper thin rings. Mix all the ingredient together and leave to marinate for about 20 minute or make in advance. Make the nuoc cham sauce by mixing all the ingredients together. Prepare the salad, soak the noodles in warm water till soft for about 15 min. Shred the carrot (I used a mandoline) and cut lettuce into thin strips. Rinse bean sprouts. Drain off noodle soaking water. Put noodles and bean sprouts together in a large bowl, pour in boiling water and leave for about 1 minute, then drain. Rinse with cold water, shake off excess water. Mix all the salad ingredients together. Pile this on serving plate or salad bowl. Mix this with 2 - 3 tbsp of the nuoc cham sauce. Heat the pan till red hot, spread the beef evenly and thinly on the hot pan, do not stir let the beef brown on the bottom then stir quickly to coat some of the caramelised bit all over the beef then ready to put beef on the the salad. Spoon on more nouc cham sauce all over the salad. Then sprinkle on peanuts. Ready to eat. ** Can sub beef with chicken or pork. Any nouc cham sauce not used can keep in the fridge and use within a week. Oh my goodness Sunflower - this looks wonderful and I dont even eat beef! Could I substitute another meat? You can use chicken, pork, prawn or even deep fried crispy tofu for veggie version. That looks fabulous Sunflower and we'll be having it next week. Thanks. I am a pure veg... so can I substitute the fish sauce for something else or just not add it. If you want to make a veg version, sub fish sauce with soy sauce, meat with fried tofu, fried seitan sausage or even fried crispy garlic bread is tasty too.